i am interested reading this article and learned a lot too. i know i have country having great history , having its on identity,...but i didn't know well this geez language. but now with Gods willing started to learn..once up on a day i wil try to teach others too like you. What you said, contrary to the other Semitic Languages Ge’ez is not represented enough. It is true You Blog and other literatures will help spread this ancient language. Ge’ez as you know is not a totally dead language. 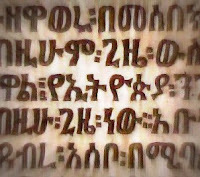 In Ethiopia and Eritrea is main liturgical language for over 40 to 50 million people. Historically, Ge’ez was the language of some tribes in Northern Ethiopia and Southern Eritrea and closely related to Tigrinya, Tigre, Amharic and other Semitic languages in Central Southern Ethiopia. As you know Ge’ez and other Semitic language belong to the super-family of Afro-Asiatic Languages. The great part of Afro-Asiatic languages are spoken in the Horn of Africa it is natural to assume that that the homeland of all Semitic languages is most likely Ethiopia. This should prop up interest in an array of studies. Although it is possible the Semitic languages originate from Africa, it's much more likely they originate from the Arabian peninsula, given that this is the central hub around which all other Semitic languages are distributed. Also the Semitic languages of the Arabian peninsula are by far the most conservative, whilst those languages existing on the periphery of the Arabian peninsula underwent varying degrees of evolution and loss of Semitic features.